Progressive Chat: Emma Gonzalez Powerful Speech at the March for our lives in DC. 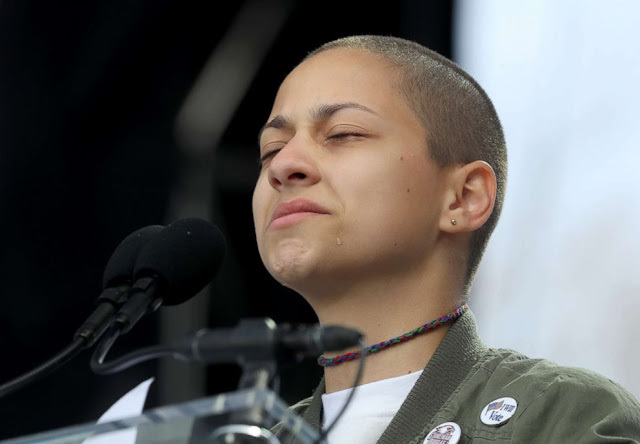 Marjory Stoneman Douglas High shooting survivor Emmma Gonzales came to fame for calling BS on our usual song and dance around guns. She is at it again, with a rowsing speech at the March for our Lives in DC. With tears streaming down her face, Emma was silent for six plus minutes. The length of the Parkland shooting. There is tremendous power in silence. I takes an incredible amount of chutzpah to stand and look at a crowd saying nothing — it is a massive space to hold. This young woman just held it while looking into a crowd of thousands. These Parkland kids are simply amazing. They are eloquent, smart and savy. Behaving like the grownups in the room and reminding adults of what is right and necessary. They are giving us hope that maybe this time it is different and we'll get more than thoughts and prayers.